Two out of 19 secondary schools "“ each with pupils over 1,000 "“ have the opportunity to introduce information technology, thanks to District 1040. They were intended for two secondary schools, each with about 1000 pupils. The whole school assembled for the handover and for the photo opportunity. Affordable Computers and Technology for Tanzania (ACTT) is an organisation run by a group of young Tanzanians for the benefit of young Tanzanians. They refurbish computers discarded by Europeans, install educational software and install them in schools. What attracted us to this organisation was their commitment and passion to help the young people of Tanzania. Moreover, they were professional – they had a well written contract, maintenance agreement and training programme – everything Rotary needs. Ukerewe has a population of 35,000 accessible only by a three and half hour ferry journey from the mainland town of Mwanza. The island has 21 secondary schools each with about 1000 pupils. Only a few have mains electricity. None had access to computers - until now. District 1040 international project team, which has been involved in a multifaceted community programme in Ukerewe. Whilst on the island on a project visit in February 2015, they decided that at least two schools should have the opportunity of introducing the children to IT and entered into a contract with ACTT. 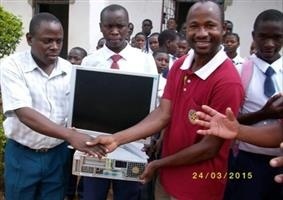 Each school has now received 5 computers, together with voltage stabilisers and other accessories. ACTT team has spent several days there, installed them and offered three days of training to selected teachers. The team will be back to provide follow up training and routine maintenance. This is only a drop in the ocean. There are 19 other secondary schools with over 19,000 pupils with no access to computer technology. This is simply not fair. If you would like to help in extending IT on the island please contact me for more information.